High quality titanium hammered wedding band ring, made with aircraft grade titanium 6-4 (6% aluminum, 4% vanadium). Available in 4.5mm - 10mm width (shown in 8mm width). Contour fit, for a more comfortable fit (the inside edges are perfectly shaped for maximum comfort yet the middle of the inside is flat such that the ring does not rock on the arc in the middle of the ring or sit too high on the finger. Titanium is a performance metal, used extensively in aerospace where strength and weight really count. Unique and cutting-edge, titanium is the stuff of dream rings--rings that will last and can be passed on for generations to come. Polished: Traditional, high shine polished finish. Satin: Right between Polished and Matte, it glows, Satin is subtle and beautiful. Matte: The matte finish is a more subdued, metallic and less reflective look. We offer ITALIC CAPITALS or, (SMALL BLOCK for longer engravings). Cost: $20.00, for up to 20 characters and spaces, dependent on ring size. 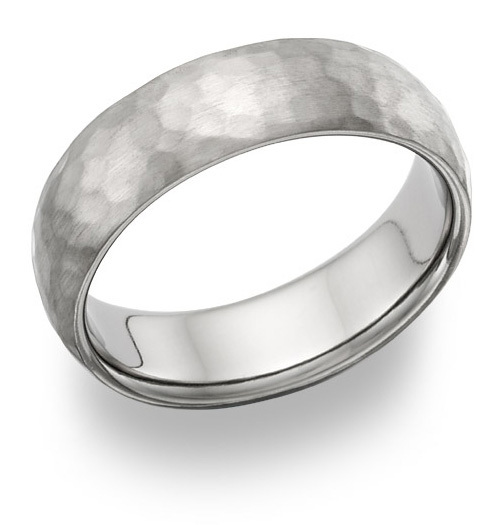 We guarantee our Titanium Hammered Wedding Band Ring to be high quality, authentic jewelry, as described above.